Ferry Athletic emerged triumphant in their Ross Ballantine cup semi final match against DUSC. The match was a thrilling affair with Ferry Athletic going 2-0 up, through Brandon McGiness and Josh McConville, before DUSC scored two for themselves, thanks to Kieren Barron and Robbie Johnson, to send the match into extra time. Owen McCord fired home for Ferry Athletic at the start of the second extra time period before Luke Queen finished off the game while DUSC were pushing for another equaliser. It was a classic cup-tie. Ferry were straight out of the blocks in the early stages of the game and needed just 2 minutes to get themselves on the score sheet. Findlay McLean delivered a Ferry corner deep into the box and, following a bit of penalty area pinball, it fell to the feet of Brandon McGiness. The number 6 struck the ball first time into the top right of the net to give Ferry an early advantage. In the tenth minute Ferry’s captain, Josh McConville, fed through Owen McCord who then had a clear run at goal. The attacker took his shot low but DUSC’s ‘keeper, Leighton Quinn, parried down to his right before claiming the loose ball. Shortly afterwards it was DUSC’s turn to have a pop at goal. Daniel Ogilvie made a fine run down the left wing before firing a cross towards the lurking Conner McHugh. His resulting effort was saved and held by Ferry’s number 1 Thomas Egan. In the 18th minute DUSC’s Aidan Simpson, in a similar fashion to Ogilvie, delivered a cross towards McHugh from the right side. McHugh directed the ball on target with a great header but could only find the hands of Egan rather than the back of the net. A minute later Ferry Athletic went 2-0 up with a fine individual goal. Josh McConville, who was starting to pull all the midfield strings for his side, picked up the ball about 25 yards from goal. The midfielder then drove towards the target, evaded several challenges, and broke through the defensive line. McConville, now in a one on one situation, calmly slotted past the oncoming goalkeeper into the bottom left hand corner to put his team in a commanding position. In the 24th minute Seff Mohammad of DUSC threatened to break through the Ferry defence with a fine individual run of his own. After appearing to successfully evade the oncoming tackles it looked as if he just had the keeper to beat, before McConville arrived at full barn storming speed to intervene and boot the ball away. Some great defensive work from the central midfielder. Nine minutes later DUSC were back in the game. Kieren Barron managed to gain possession of the ball and found his way into the right side of the box. The number 7 then slotted past the oncoming Egan to reduce the deficit to one. Just before the half time whistle DUSC’s equaliser nearly came. Deano Fowlis managed to receive the ball into his feet within the penalty area and unleashed a fierce shot at goal. Unfortunately for him it was straight into Egan’s arms. The second period also began with a bang. In just the fifth minute of the half Ferry came close to regaining a two-goal lead. Their tricky wide man, Findlay McLean, managed to feed a ball through the DUSC defense for Owen McCord to run onto. The number 9 would have reached it had DUSC’s goalie, Leighton Quinn, not had his brain switched on. The stopper was alert and sprinted towards the ball managing to claim the ball just before McCord was able to reach it. In the 48th minute of the game DUSC’s number 8, Daniel Ogilvie, managed to break through in a similar fashion to Mohammed’s opportunity in the first half. Unfortunately for Ogilvie his chance also had the same result, tackled and disrupted by McConville who had, again, dropped back from midfield to help out his defence. In the 59th minute DUSC grabbed their equaliser. Reece Muir, the DUSC left back, produced a great solo run down the left flank leaving the opposition defenders in his wake. The number 3 then delightfully and skillfully cut the ball back into the 6-yard box where Robbie Johnson was there to meet the cross. His resulting first time shot struck the bar and bounced straight down on the correct side of the goal line. With just 11 minutes left of normal time this semi final was well and truly on. In the final minute of normal time Ferry Athletic very nearly grabbed a winner. McCord gained possession of the ball around the half way line and drove towards the penalty area. The forward then laid the ball off to Stewart Hogan who, in turn, fed a through ball towards Luke Queen. With all the defenders taken out of the move it was a straight race between Queen and the DUSC goalkeeper. Luckily for the tangerines Quinn got to the ball first and booted it away before Queen made contact with him. The referee then blew up for a foul on the keeper and the opportunity was lost. Shortly afterwards the final whistle went and it was time for an extra two periods to try and find a winner. The first half of extra time was mainly a midfield battle with both sides cautiously probing in search of a winner. DUSC had the best chance of the period when Ogilvie managed to launch a threatening cross in from the left wing. The ball was directed towards Johnson but the diminutive attacker was just beaten to it by the Ferry ‘keeper, Egan, who caught the ball well to relieve the pressure on his side. In the first minute of the second period the decisive goal came in favour of Ferry Athletic. The DUSC goalkeeper had parried an initial strike from Ferry but the ball arrived at the feet of McCord who went for a successful lobbed finish. Despite the ‘keeper managing to get fingertips to it the ball was just too high and it nestled in the net, much to the jubilation of the Ferry Athletic support and players. Five minutes later with DUSC pushing for an equaliser Ferry managed to hit them on the break to grab a fourth goal and kill off the game. Luke Queen managed to break free of the defence, expertly rounded the goalkeeper, and slotted home to make the score 4-2. This left DUSC with too much to do with too little time and this is how the game finished. Ferry Athletic were Ross Ballantine Cup finalists. One talking point that arose from the final whistle was the referee’s decision to only play seven and a half minute long periods in extra time rather than the expected ten. The decisions of the tie in relation to this will be decided soon. From the teams perspectives both sides put on displays that showed resilience at it’s finest and it served up one hugely exciting cup-tie. DUSC and Ferry Athletic can take a huge amount of positives from the game and both the managers spoke of how immensely proud they were of each player that stepped onto that pitch. That sentiment can be echoed by this reporter, who thoroughly enjoyed watching his Sunday afternoon entertainment. Robbie Johnson – Looked a constant threat for the Ferry defence and proved that with his equalizing goal. A great finish considering the pressure at that point in the game. Josh McConville – Yaya Toure in disguise? The Ferry captain was instrumental in the midfield. Retained the ball well and contributed significantly in attack and defence. Scored his teams second goal and made two vital last-ditch challenges. Robbie Johnson’s goal to make it 2-2. 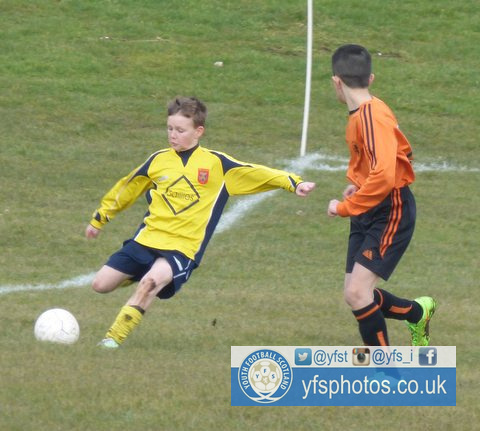 Not just the superbly executed finish but Reece Muir’s marauding run from left back were great to watch. Josh McConville’s goal to make it 2-0. Great solo effort bursting through midfield and then the defense to set up a one on one with the goalkeeper. Composure throughout to slot home like that too. Ian McHugh, Manager – ‘After going 2-0, early doors, I commend the boys for their attitude and for getting it back to 2-2. We’re absolutely proud of them.